Gryphon Black Spikes are made of Polymethylmethacrylate. Because softer surfaces represent a unique set of resonance control challenges, Gryphon offers the Black Spikes ST (Steel Tip), fitted with a precision-tooled steel tip for optimal energy transfer to a softer underlying surface. The height of each steel tip can be adjusted individually for perfect leveling. Gryphon Black Spikes ST create an evacuation path between the equipment and the outside world, acting as mechanical diodes, conducting energy in one direction and effectively blocking it the other way. 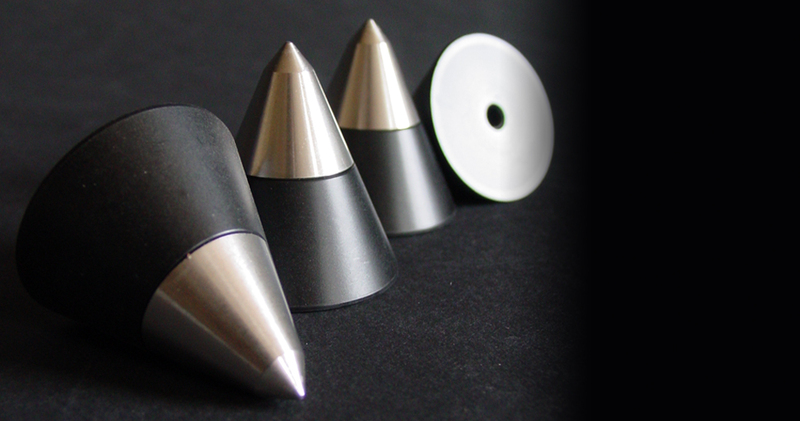 Gryphon research has shown that the size, shape and material of spikes can have significant influence on sound quality. Specifically, brass, steel and other hard materials can actually store some of the energy that they are intended to transfer. Extensive listening sessions confirm that the mechanical characteristics of this rigid synthetic make it an ideal bridge for vibration.